Coming off a record-breaking 25-7 record, an A.I.I. championship game appearance, NAIA national tournament appearance and rising to as high as No. 12 in the national rankings, what can Indiana University Northwest Women's Basketball do for an encore? The RedHawks were picked second amongst 14 teams in the 2017-18 A.I.I. pre-season poll just behind College of the Ozarks, who defeated the RedHawks on the Ozarks' home floor in the A.I.I. championship last February. The 2017-18 RedHawks are led by senior and three-time All-A.I.I. Conference selection Grayce Roach (SR/Hobart). Roach is a first-team All-A.I.I. selection in 2017 who is entering her fourth and final season with the RedHawks. Roach averaged 15.7 points per game a season ago while shooting .471 from the floor and .400 from 3-point range and is widely considered a consensus pre-season A.I.I. Player of the Year and NAIA All-American candidate. With Monahan's departure, senior Weslee Wilson (SR/Monroe City, Ind.) is projected to fill the vacancy in the starting lineup. Wilson arrived last fall as a junior college transfer from Olney Central and took on a valuable role, making significant contributions off the bench. Now more than one full year removed from knee surgery, Wilson, (6.0 ppg, .357 3pt), is strong bet to capitalize on a starting role and opportunity. "Roach is a proven commodity at the national level and Wilson has been, arguably, our best player this pre-season," Shelton said. "Both offer a rare combination of strength, speed, athleticism and skill at the NAIA level. They're a good bet to be one of the top backcourt tandems in the conference, if not the nation." In all, the RedHawks return 11 lettermen and three starters from their 2017 National Tournament Team. Also returning is two-year starter and point guard Gina Rubino (JR/Crown Point) with 5.5 ppg, .424 3pt, who was named to the 2017 A.I.I. All-Tournament Team. Rubino’s leadership has proven to be a catalyst since returning to practice as she missed most of the pre-season with a foot injury. At 6-1, Kelsey Gushrowski (JR/LaPorte) (5.4 ppg, 5.3 rpg) is expected to anchor a RedHawks frontcourt that also includes returners Alexis Bake (4.1 ppg, 4.0 rpg, .470 fg%) and sophomores in 6-1 Jocelyn Coburn and 6-5 Lisa Gac (SO/St. John). Carly Siems, Ciara Sundermann (SR/Pleasant Valley, Mich.), Erin Mullaney (SO/Hammond) and Jayla Crump (SO/Kouts) are amongst the perimeter players with the 5-10 athletic Crump targeted for an expanded role this season. New additions to the RedHawk roster are led by junior college transfer (Kalamazoo Valley CC) and NJCAA All-District and All-Region guard Chloe Salman (JR/Paw Paw, Mich). Salman, an explosive scorer who can score at all three levels, averaged 14.1 ppg, 4.0 rpg, .410 3pt and .810 ft% as a sophomore in leaving KVCC to the NJCAA national tournament. Salman can score in bunches and figures heavily in Shelton's plans to help offset the 20.0 ppg the RedHawks lost in their lineup due to Monahan's graduation. "Chloe has been impressive in practices. She can get to the rim, has a great mid-range game and is a potent three-point shooter,” Shelton said. “There won't be many teams that can match our combination of speed and scoring power that we have with the trio of Salman, Roach and Wilson." Other new additions include junior college transfer (Griffith/South Suburban) and point guard Alyssa Gebo (JR/Griffith) who brings valued experience and toughness to the RedHawks backcourt. Sophomore Ashley O'Malley (SO/Crown Point) (Lake Central/Anderson) also arrives as a transfer and offers position versatility and experience to the roster. Freshman and 2017 All-Area selection Kali Winkler (FR/Hobart) put up stellar numbers (17.0 ppg, 7.9 rpg 4.1 apg 3.7 spg) at River Forest High School in Hobart, and brings athleticism and unique play-making ability to the roster. Also new to the RedHawks' roster are impressive freshmen Alaina Richter (FR/Hobart) (Hobart) and Jesse Siems (Hanover Central). 2017 All-Area selection, 5-11 guard Shannon McCoy (FR/Chesterton) suffered an unfortunate knee injury in the pre-season and will redshirt the 2017-18 season. The RedHawks’ seven losses last season (25-7) were to teams all ranked in the top 12 in the final NAIA Top 25 National Coaches Poll. Five of the losses were to teams ranked in the top 5. This season's 2017-18 schedule offers a similar challenge where the RedHawks prepare themselves to play eight games versus opponents that appeared in the NAIA National Tournament last March. Highlights include road matchups with CCAC foes Saint Xavier and Saint Francis (IL) and a home tilt with Olivet Nazarene. A home rivalry series with IU Kokomo and a A.I.I. Conference showdown with defending conference champion College of the Ozarks on Jan. 29 in the A.I.I. Classic hosted by IU Northwest are marquee games. The RedHawks will also square off with NAIA D-1 National Tournament Qualifier Pikesville in the opener of the Sienna Heights Thanksgiving Classic on Nov. 24. Other schedule highlights include matchups with Crossroads League foes Grace, Bethel and Huntington as well as meetings with Madonna and Cornerstone from the WHAC. 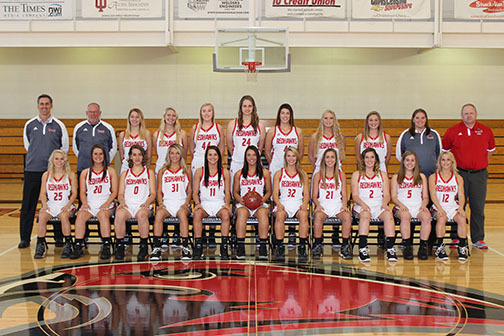 The RedHawks will square off with several Chicagoland opponents in Addison to St. Xavier, Olivet Nazarene and St. Francis when they face Judson, Trinity Christian, Roosevelt, and home and home with IU South Bend. The RedHawks will also square off with a pair of NCAA Division I opponents when they travel to Chicago to face the UIC Flames at the Pavillon and later on Dec. 13 to challenge Valparaiso at the ARC in Valparaiso.